Stunning art is accompanied by details relating to each city icon -- suitable for educating those who have seen pieces of NYC here and there but haven't quite grasped all the names or the stories behind the landmarks. 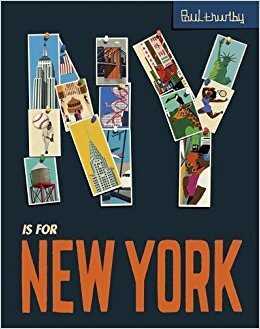 Though the artist is not from New York (initially a hard truth to swallow, given the wealth of creatives who reside there), there's something special about being able to collect a series of titles representing great cities in matching illustrative style, which you can with Thurlby's work. I've been a fan of Thurlby's work ever since I came across this alphabet of his. His illustrations make everything look cool, and the cool look even cooler.